RED CURRANT, ROVADA (Ribes rubrum Rovada). Fruit. 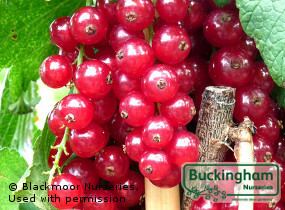 Very long strigs of outstandingly tasty redcurrants. Produces enormous yields on bushes of upright habit. Self-fertile. Self-fertile. 2 year bushes. Plant 6ft (1.8m) apart. This plant is registered for Plant Breeders' Rights. Propagation by unlicensed growers is prohibited.